Holy week in this parish started with Palm Sunday service all indoors without the procession along Stony Stratford High Street because of the weather, followed by the Parish Singers giving their annual Lent Cantata, which this year was ‘The Last Week’ by John W Petersen. The Maundy Thursday and Good Friday services were solemn, sad and beautiful as we recalled the terrible but saving events of Holy week. The Easter Vigil last night was hopeful as we lit the Pascal Candle and caught our first glimpse of the empty tomb and this morning’s service was joyous as we celebrated the risen Lord. Below are some photos of the Easter Garden in St Mary & St Giles Church this year. This year the Young Christians coffee morning was in the Parish Hall which was lovely and warm in the snowy weather. 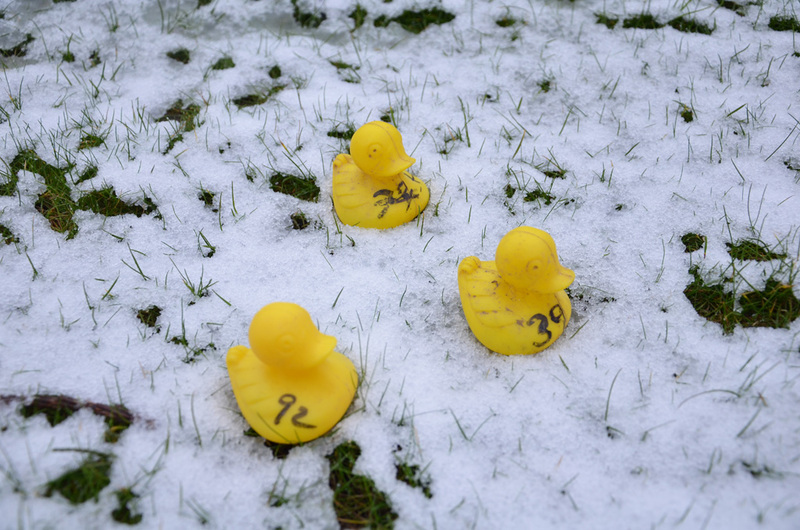 The duck race, which is traditionally held on the river Ouse near the weir at the Mill field was indoors because of the dangerous condition of the river, so the three winning ducks were drawn at the end of the coffee morning, during the Lent lunch. The line of pennies raised £33.19, the duck race raised £124, bric a brac stall £61.87. These funds will go to the Parish Lent appeal which is the Additional Curates Society. The residents of Fegans court knitted about 100 chicks containing creme eggs, and £122 was raised for MK Foodbank. £71 was raised on the refreshments for the church restoration fund. For those of you who are not sure, I am 21 years old, have just graduated with a BA (Hons) degree in Musical theatre, and am now working at The Shrine of Our Lady of Walsingham. I am currently on a volunteering programme called Yr4God, along with two other young people, which is a scheme here at the shrine, dedicated to equipping young people to serve God. The scheme is aimed at 18-25 year olds, who are are seeking somewhere to serve God, grow in their faith, and be open to an exciting and challenging ministry. We are part of the ministry team here in Walsingham and take part in the Laying on of Hands, Sprinkling, all the masses and services, and generally help around the shrine. Our biggest input to the shrine, however, is the work we do with the youth that come on pilgrimage here. We have organised a weekend programme for 6 to 16 year olds that works alongside the regular adult weekend programme, but is tailored to suit the ages of the youth that attend pilgrimage each weekend. We also plan and organise all the big pilgrimages throughout the year; Bible Week, the Families’ Pilgrimage, Adoremus, the Children’s Pilgrimage, The National Pilgrimage and the Youth Pilgrimage. I decided to apply for the Yr4God scheme because I felt called to do something More to serve God. I felt that Walsingham was the place for that. As someone who has been brought up going to church I have always had a strong faith, but growing up as a ‘church-goer’ was quite difficult. Thanks to my own parish, and to Walsingham, I have come through that and am a much stronger person because of my faith, however I have unfortunately seen friends drift away from that, so while I am here in Walsingham I really want to show youngsters that it is ok, and fun, to go to church and to have a faith. I want them to realise that if they have God in their life, He will help them to be stronger people and show them how to live a more fulfilling life. As I would like to be a teacher in the future, I also think I am gaining excellent experience to equip me for my future studies and career. Since arriving in Walsingham, it has been super hectic!! We started here at the beginning of October and Bible Week was in October half term, so we had to get going with the planning for that! Our theme for the week was Ephesians so we decided to pick out themes to teach to the kids, with a different theme for each day. Through the use of drama, art, games and fun, we taught them about the importance of Unity, both within our own community and with our faith; we taught them about living in the light of Christ and how we can share the light with others; and we taught them about the armour of God and how we can put on the armour of God to help us fight the bad things in life. At the end of the week, a nine year old boy stood up in front of the nearly 200 people attending the pilgrimage, and spoke about what he had learnt that week. He spoke with such knowledge, confidence and ease; it really gave us the boost we needed to do well for the rest of our year in Walsingham. We were off to a flying start! A few weeks later was the Families’ Pilgrimage, so as soon as Bible Week was out of the way we were back to planning for our next big thing! The theme was all about being a workshop for the Lord, so we started by having Joseph in his workshop, and showed the annunciation through his eyes. The weekend then went on with gusto, working the same way as a usual pilgrimage would but, of course, with a twist. 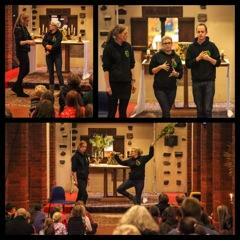 All the services, masses, readings and teachings were aimed at the children – and the adults enjoyed being big kids! We had everything from painting nails to puppets, from workshops to water guns. We all had such a fabulous time and really enjoyed working with all the children (and adults!) that attended, and meeting so many fantastic people. Then, as Christmas drew nearer, it quietened down quite a bit. We took a trip to Birmingham to do a Youth Mass in the cathedral, and we also had our 18-30 Pilgrimage, Adoremus. We caught up with old friends, met new ones and generally had a great time in, and out of, worship. For the last couple of weeks before Christmas we worked around the shrine: in the sacristy, the garden, the refectory and norton room, the shrine shop, and in reception, still only just getting to know everyone and how the Shrine worked – we had been so busy with planning we were only just getting used to the place! On our last night, we had a wonderful Christmas party and then I was back home for Christmas! What a lovely end to the season. I know I saw most of you over the Christmas holidays, but for those I didn’t see, I hope you had a great Christmas and new year! I have now been back in Walsingham for a couple of weeks and very pleased to be back! We have been carrying on with working around the Shrine and helping out, and getting on with the planning for our next big Pilgrimage which is The Children’s Pilgrimage. Last weekend, we were down in Barkingside, East London, where we had to do sermons for both a Family Mass and a Youth Mass. We had a wonderful time away, and thoroughly enjoyed being involved with other parishes, and helping them with their youth work. There are plenty more photos in the exhibition at the church.